Mad or divinely inspired? Social commentary or tragedy? Those treacherous mires were balanced and carefully unanswered in the opera Don Quichotte by Island City Opera of Alameda, which opened this past Friday in a production that was rich, colorful and energetic. Loosely based on Miguel de Cervantes’ seminal novel, Don Quixote, the 1910 opera by French composer Jules Massenet takes a very French Romantic view of an early seventeenth century Spanish classic and, in the process, turns the protagonist from a passionate fool into something more heroic and even holy. But that is to be expected with opera, and this treatment was no exception. Under Igor Vieira’s directing we got nimble action and staging that never stumbled, along with a slow building of the characters to create out-sized emotions that squeezed the audience through a wringer. And perhaps that emotional wallop was reinforced by the gradual realization of our own inner fools, desperate for truth and crowned with thorns. Vieira was even more gifted in his own comic acting and in his rich baritone, an unlikely asset for the role he played as Sancho Panza, sidekick and straight man to the Don. But that bright voice was a balance to the two leads. Buffy Baggot, long known to Bay Area opera fans, played Dulcinée with coquettish acting and in a soprano that was acrobatic, full and buttery, an arresting vehicle that made her the center of her every scene. Her ardent suitor, Don Quichotte, was played to the hilt by William Pickersgill in a deep bass voice that was dry and even a little husky. His voice was filled with presence, while his acting held a sense of otherworldliness, a perfect fit for the character whose love of tales of chivalry has robbed him of sanity. In fact, he so inhabited the role that it felt like Pickersgill was playing himself. And then there is the back-story. When Don Quichotte falls to his knees and professes his love for Dulcinée, I remembered reading that Pickersgill and Baggot are actually betrothed to be married in real life! And when she playfully rejected him I knew they were going to be a hot team on stage and off. When Don Quichotte meets the brigands and is bloodied but unbowed, he calmly tells his Maker that he is ready to be received, and the brigands lower their heads and gather around his tall gaunt frame and beg for his blessing. Something transcendent happened here. I don’t know if it was the follow spot that made his face shine so, or if it was the power of his love that gave him that halo, but he tells them he understands them and calls them his sons. Delivered with a graveled voice and deep humility, this was the goods, and more than a few audience members felt a shiver. Phillip Kuttner conducted the score with excellent tension, but Massenet is a little too weepy in the strings and bright in the woodwinds, and full of triangles and harp and wooden blocks. In other words, it is very French and exaggerated, with moods that shifted on a dime from tragic to manic. But somehow that music worked as a springboard for the big emotions of the opera and the excellent musicians rendered it all, including woodsy clarinet moments, thundering church chords, magisterial horns, agitated violin tremolos, fake-Spanish flamenco, and a gorgeous cello aria. The chorus had real depth, with the many comprimarios, the smaller singing roles, joining in for a sound that was almost too large for the Elks Lodge Ballroom. While that hall is spacious and the ceiling vaults into a large round stained-glass skylight, it is not quite as high as performance venues for orchestras, where the height is a helpful mixing chamber. But for voice, the dimensions add reverberation. Each performer could project their sound while maintaining an intimacy, like the ornate village halls of Italy. And about that skylight: during the last scene [spoiler alert] when Don Quichotte sees a vision of his love coming down to receive him, I looked up and realized that the skylight was of a clock, with the hands pointing at 11:00. That is the hour when all Elks join in remembering those who have departed. Creepy. But especially for those fresh to the art form, this is the way to see opera! At round tables in the front there were tidbits to eat and everyone could bring their wine glasses in with them, just like the growing trend in movie theaters. This three-year-old opera company may be “tilting at windmills” to succeed, but last Friday that struggle was sublime. Don Quichotte has two more performances, Friday, March 10 at 7:30 p.m. and Sunday, March 12 at 2:00 p.m., both at the Elks Lodge Ballroom at 2255 Santa Clara Ave, Alameda. See islandcityopera.org for program notes and tickets. 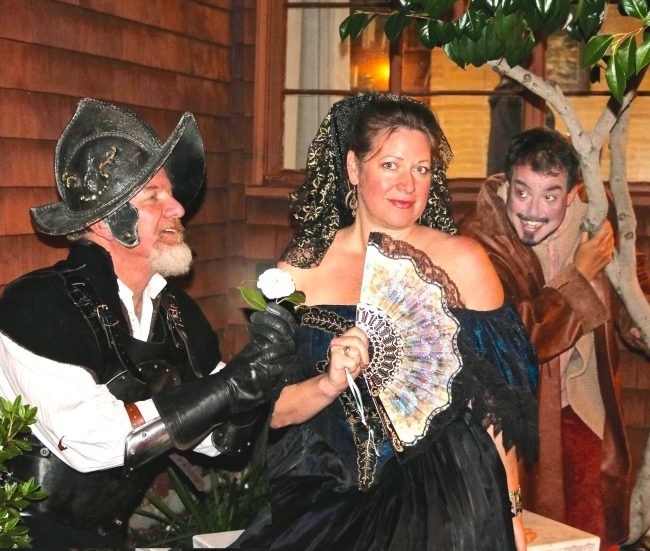 Photo of William Pickersgill as Don Quichotte, Buffy Baggott as Dulcinea, and Igor Vieira as Sancho Panza; photo courtesy of Island City Opera.